Shipping time for items ordered is as indicated on item detailed page. Lead times are subject to change. For example, if the item is backordered by vendor. Although we sometimes offer extra discounts during promotional periods the following brands are excluded due to manufacturer advertising and selling policies. Please call us for further details. 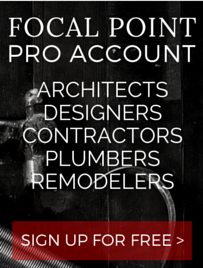 Focal Point takes every measure to ensure that the products, their descriptions and prices are accurate at all times. There may be errors from time to time on the products, their descriptions or prices and Focal Point is not responsible for errors or misrepresentations that may appear on the site. Please note that the color of any picture on www.focalpointhardware.com will appear slightly different based upon the display settings and resolution settings of the computer being used. All pictures on www.focalpointhardware.com should be regarded as product renderings only, hence there may be small details that differ from product to image. Please contact us with any questions prior to ordering. Here at Focal Point, we try our best to keep all model numbers, images and descriptions up to date and accurate there are times when errors occur. We order product based on MODEL NUMBER, so if you see a discrepancy please ask so we may clarify. Shipping will be charged at $9.95 USD per order to the 48 contiguous United States. All orders that are over $100.00 USD will be given free shipping to the 48 contiguous United States. Orders may be delivered in multiple shipments. If the total order is over $100.00 USD there will be no charge for any of the shipments. We offer free freight (truck for larger items such as but not limited to tubs or vanities) deliveries, however they are sidewalk delivery only. Please contact us if you need to make special arrangements and there may be delivery up-charges associated with said arrangement. There may be exceptions to the free shipping rules. They will be so indicated at checkout. There is a minimum 25% restocking fee for any item that is returned or exchanged for any other reason than the item being damaged in transit or having a defect. Please see our Shipment Damages section below. Orders are processed within 24 hours of receipt. Cancellations will be accepted within that period if the item did not ship. Once an order is processed any cancellations, if approved, will be subject to a processing fee. Any special or custom order merchandise cannot be returned, exchanged or cancelled. Please check with us if there are any special/custom order items in your order. Please note that vanity tops, medicine cabinets, handmade sinks, and miscellaneous parts,cannot be returned or exchanged. All return requests must be made within 14 days of receipt of the items. The customer is responsible for all return freight on merchandise returned. All return shipments must be traceable and insured. The return shipping is the responsibility of the customer. The customer will handle any damages and claims for damages found during return shipping. Focal Point cannot issue a credit for such damaged merchandise. Returns shipped via USPS will not be accepted. There are no returns or cancellations on specials, closeouts or any product sold over a 50% discount (This includes Brizo accessories). All items received via UPS or FedEx should be examined for defects upon receipt. Please contact us within 48 hours of receipt of defective merchandise. We cannot honor any claims that are placed after 48 hours of receipt from UPS or FedEx. If you receive a shipment via truck please inspect your order for damages IMMEDIATELY. If your item(s) is damaged, please do not accept the delivery and our trucking company will return the item(s) to us. Please keep all packaging materials, as you may need to repack the items for the return shipping. Returns that do not come in their original packaging materials may not be honored. Failure to follow these procedures will exclude your ability to return/exchange damaged merchandise.